Hanoi (VNA) – Deputy Prime Minister Trinh Dinh Dung has assigned the Central Steering Committee for Natural Disaster Prevention and Control, the Ministry of Agriculture and Rural Development to work with other ministries and localities concerned to build a master plan on prevention and control of natural disasters for mountainous areas. 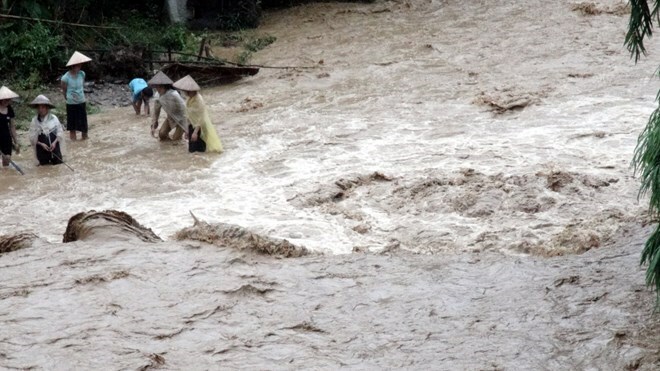 The move aims to fix problems still existed in the prevention and control of natural disasters, said the Deputy PM at a conference discussing response to the seventh storm and post-storm floods and rains in Hanoi on August 27. The master plan is requested to prevent landslides and flash floods in combination with restructuring residential areas and mainstreaming the efforts to ensure sustainable livelihoods with that to protect and develop protective forests in key areas. It is asked to be submitted to the Prime Minister. The Deputy PM asked localities to keep a close eye on the movements of the seventh storm (internationally known as Pakhar) and its possible threats to minimize its losses. By the noon of August 27, typhoon Pakhar landed the southern part of Guangdong province, China, bringing gales of up to 33 meters per second. It is forecast to weaken into a tropical depression and likely cause torrential trains. He asked localities prone to rains and floods to continue reviewing areas vulnerable to flash floods and landslides and proactively design plans to evacuate residents while the national committee for search and rescue prepares forces and vehicles to support localities. In the long term, the Ministry of Natural Resources and Environment needs to work on a map on geographic accidents in general and landslides in particular. The Ministry and Agriculture and Rural Development is asked to coordinate with professional agencies to soon organize a seminar on geographic accidents and build a project to develop a weather monitoring system in areas vulnerable to natural disasters.